I can barely get my arse out of bed in the morning if it is an ordinary work day but if there is an early start for a fishing trip I hardly even need to set the alarm. This morning was typical. I woke at around 5.00 am and decided to get up and hit the road. The alarm on my phone went off when I had already broken the back of the journey to the reservoir and my arrival coincided with the first bit of light that was good enough for fishing. 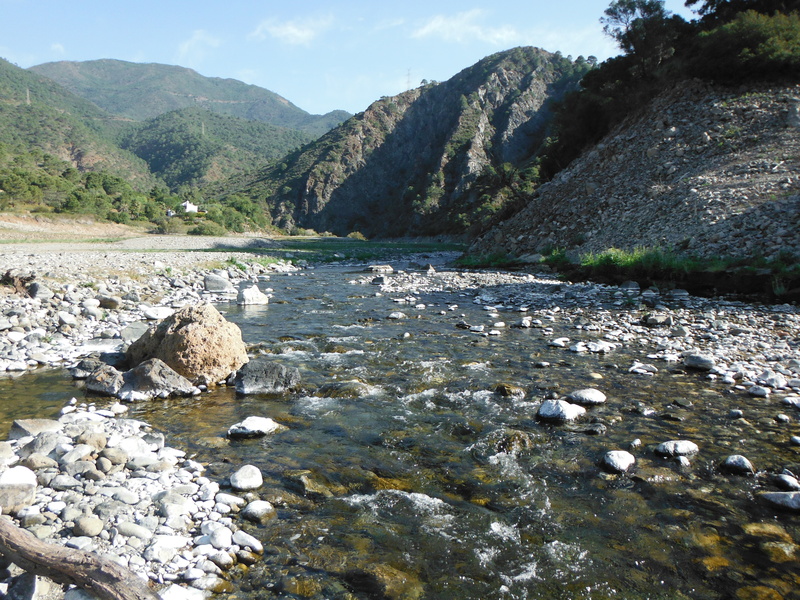 Concepción reservoir is within spitting distance of Marbella and close to the town of Istán. It is tricky to find a place to fish here if you are on foot but if you can get out in a boat or a float tube you can cover the water easily, or at least part of it, because the reservoir is pretty big – some 5 km from the dam wall to mouth of the Río Verde. There are plenty of carp here but they generally small and uncooperative, but if it´s black bass you´re after the fishing here is pretty good. There are some big ones too. I paddled around the north arm of the reservoir up to the river mouth fishing one shore on the outward leg and the opposite shore on the return leg. The fishing was pretty good and fish rose to poppers as well as taking a sinking fly. 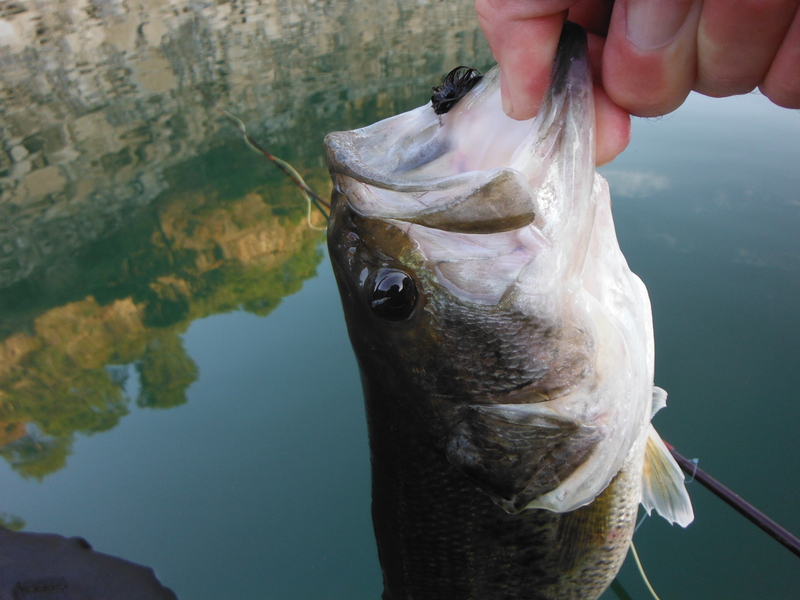 One interesting observation was one bass which, as I was unhooking the popper, seemed to have something in its throat. 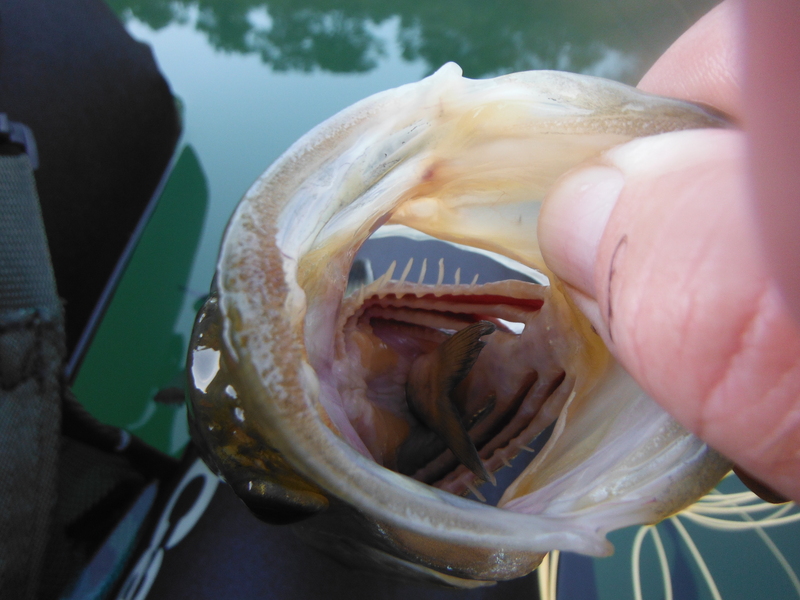 This turned out to be the tail of a small fish, maybe another black bass. I guess it had just swallowed this thing when the popper arrived on the scene. Interestingly, the fish were happy to take a sunk fly fished quite slowly. I tended to cast towards the shore and retrieve very slowly or paddle gently. If the fish were there everything would tighten up nicely. I guess he hit the nail on the head. The black bass is an introduced fish from North America. 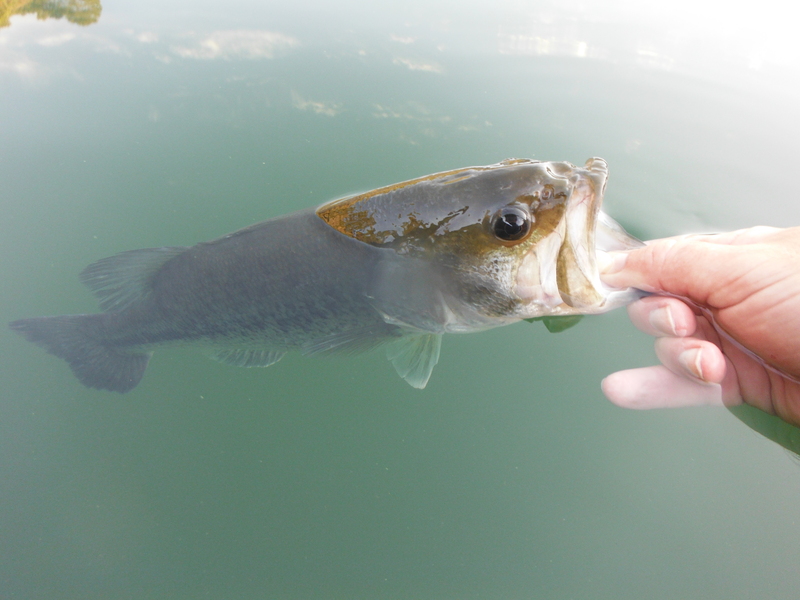 The alternative name – largemouth bass seems quite apt! 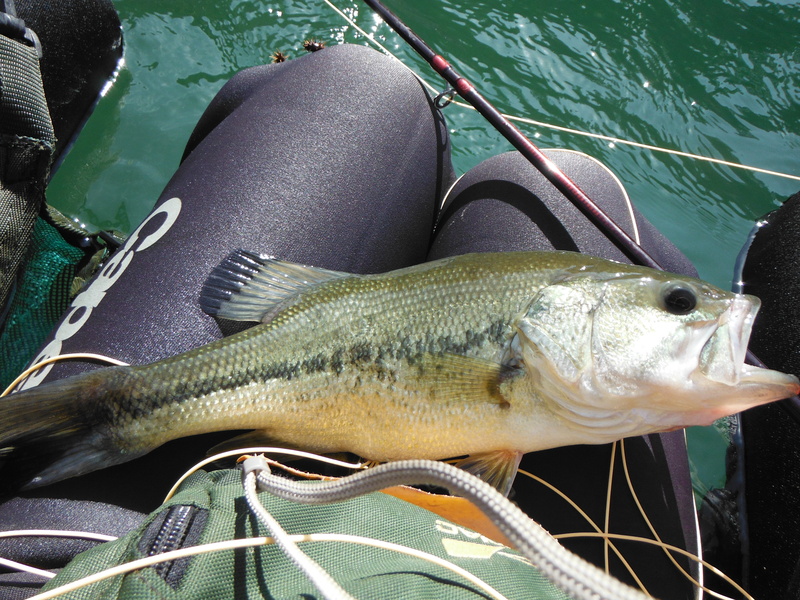 When you release the bass and they realise they are free they will often dive down and splash you with their tails! Beautiful country this, here is the Rio Verde. Until the construction of the dam this river would run to the Mediterranean. 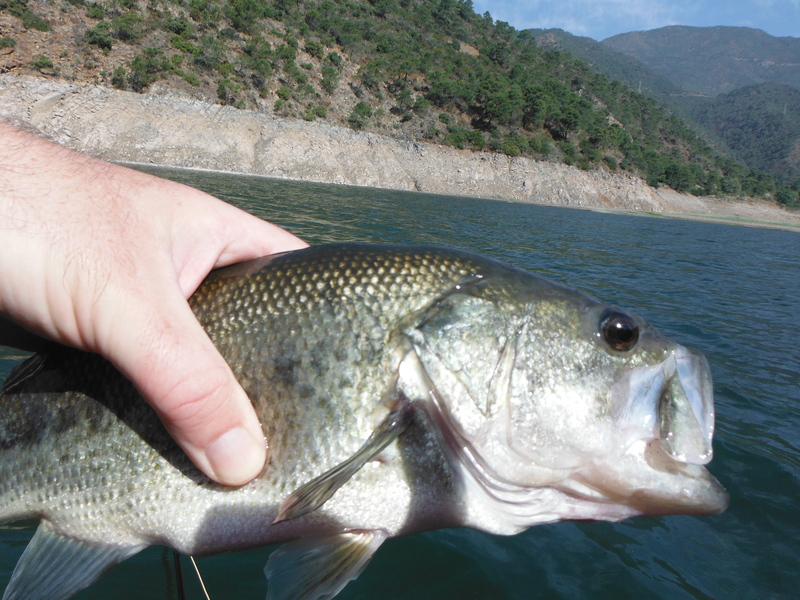 Hi, I’ve fished a couple of times at Istanbul a few years ago and caught plenty of bass, we were at Concepcion about ten years ago for half a day and caught a few small ones. I’m hoping to be there again in mid September, can you give me an idea how the fishing might be at that time of the year. We’d fish fly or spinner. Hi Lawrence, first of all my apologies for being so long in responding to your post. I only just spotted it now! We tend to fish Concepción from float tubes and fish with flies but the fish would respond to lures as well I imagine. You may remember that access to Concepción is quite difficult as it is steep-sided and so it is a big advantage to get afloat if you can. You are welcome to borrow a float tube from me if you are stuck. Our usual approach is to cast flies and poppers close to the margins and work our way around the water. It´s great fun and the scenery is stunning. You can often see ibex on the mountainside. September is a good time to go. The fish should be in good form but the ager levels might be low. It is a little while since I fished there so I don´t know what they are like at the moment but if you keep an eye on the blog I will report back on any visits I make between now and then. I hope that helps! Sorry again about the delayed response. All the best, Paul.